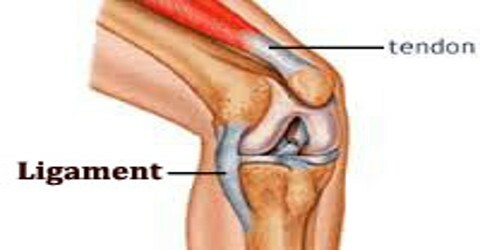 Ligament is a sheet or band of tough fibrous tissue that connects two bones or holds an organ of the body in place. It only connects bones to bones. The basic building blocks of a ligament are collagen fibers. These fibers are very strong, flexible, and resistant to damage from pulling or compressing stresses. Collagen fibers are usually arranged in parallel bundles, which help multiply the strength of the individual fibers. The bundles of collagen are attached to the outer covering that surrounds all bones, the periosteum. 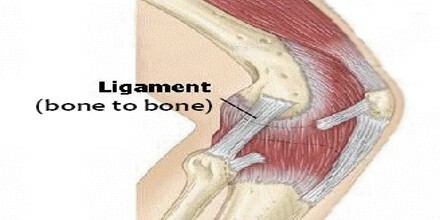 Ligaments are slightly elastic and composed of parallel collagenous bundles. When part of the synovial membrane of a joint, they are covered with fibroelastic tissue that blends with surrounding connective tissue. Its need to be flexible, to facilitate joint movement, but relatively non-elastic to provide strength and stability and to limit the range and direction of movements at a joint. Ligaments cannot usually be regenerated naturally; however, there are periodontal ligament stem cells located near the periodontal ligament which are involved in the adult regeneration of periodontal ligament. Ligament is a band or sheet of fibrous tissue linking two or more bones, cartilages or other structures, or serving as fascial or muscle support. A ligament is composed of dense fibrous bundles of collagenous fibres and spindle-shaped cells known as fibrocytes, with little ground substance. At joints, ligaments form a capsular sac that encloses the articulating bone ends and a lubricating membrane, the synovial membrane. Sometimes the structure includes a recess, or pouch, lined by synovial tissue; this is called a bursa. Other ligaments fasten around or across bone ends in bands, permitting varying degrees of movement, or act as tie pieces between bones, restricting inappropriate movement. 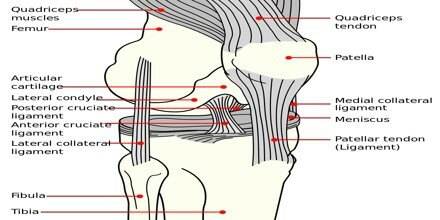 Our knee joint is classified as a hinge and a synovial joint. In a synovial joint, the bones, in this case, the femur and tibia are separated by a joint cavity filled with fluid. Synovial fluid is a thick, slippery liquid that lubricates the joint, supplies nutrients, and removes waste products. The articular capsule is two layers of connective tissue that hold the bones in place and prevent the fluid from leaking out. Outside of the articular capsule are ligaments called extracapsular ligaments. They function to hold the bones in place, provide stability, and prevent dislocation injuries. Some ligaments are located inside the articular capsule and are referred to as intracapsular ligaments. The intracapsular ligaments of the knee still connect the femur and the tibia, and they perform two tasks. Artificial ligaments are a synthetic material composed of a polymer, such as polyacrylonitrile fiber, polypropylene, PET (polyethylene terephthalate), or polyNaSS poly (sodium styrene sulfonate).